View More In Travel & To-Go Drinkware. Leak-proof, expandable, and unbelievably powerful, the BlenderBottle ProStak is the all-in-one solution for the serious athlete. The patented BlenderBall wire whisk delivers smooth shakes every time, while the unique Twist n' Lock jars offer unlimited storage expandability. Keep powders and pills in place - with or without the bottle. The ProStak's unique interlocking jars have individual lids, making it possible to carry pre- and post-workout supplements, meal replacements, and snacks, even without the bottle. The ProStak's screw-on lid and leak-proof SureSeal flip cap keep your shake where it belongs. With a snug twist of the lid and the assuring snap of the flip cap, you're ready for some serious shaking. The BlenderBall wire whisk delivers lump-free protein, nutrition, and meal replacement shakes, even blending flavorful additions such as peanut butter, yogurt, and oat flour. 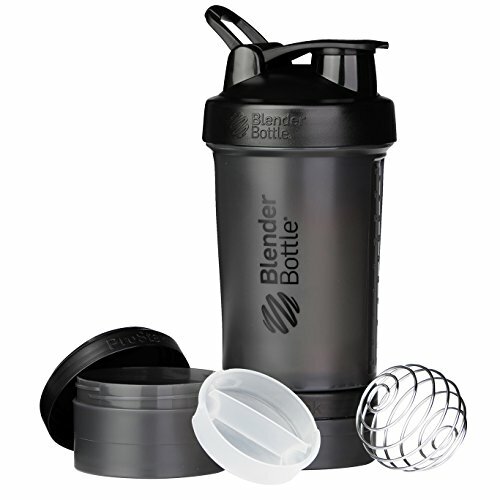 Includes 22 ounce capacity BlenderBottle, 150cc jar, 100cc jar, pill organizer and patented BlenderBall wire whisk. The BlenderBottle ProStak is expandable with extra Twist n' Lock jars (sold separately). If you have any questions about this product by Blender Bottle, contact us by completing and submitting the form below. If you are looking for a specif part number, please include it with your message.